All Aboard to the American Astronomical Society Meeting! For those of you astronomers and journalists at the meeting, you’re welcome to join us for our Special Session next Wednesday (7th January) at 12:30-14:00 in Room 4C-3. We’ll be starting the new year with ideas and plans for addressing climate change issues in class and with the media. We encourage anyone who is interested in the Sustainability Committee to contact us and get involved. We will post resources on this website for teaching and discussing climate change with journalists. It’s important for astronomers to try to make observatories, telescopes, university department buildings, and computer centers as energy efficient as possible, but our largest environmental impact and carbon footprint comes from airplane flights to meetings, conferences, workshops, etc. According to a New York Times article, air travel emissions account for about five percent of global warming, and that fraction is projected to rise significantly as the volume of air travel is increasing much faster than gains in flight fuel efficiency. It would help this situation to develop better resources and technologies for videoconferencing and remote observing, and these are areas where we should continue to make improvements. 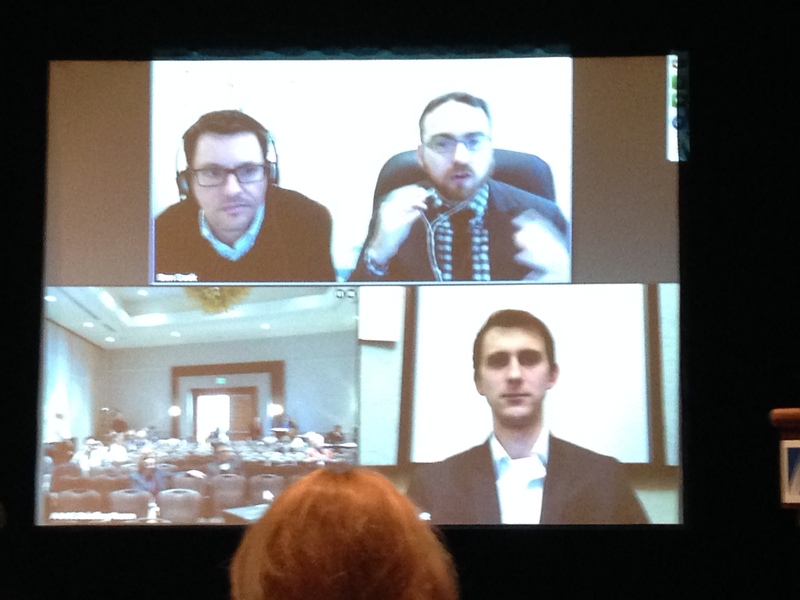 In addition, long-distance travel can be difficult for some people, such as for those with families and those in relatively remote locations, and videoconferencing and webcasts can make conferences more accessible to more people. Nonetheless, long-distance travel is sometimes necessary, including for early-career scientists who need to advertise their work and network at conferences. I joined the Sustainability Committee in 2014, and one thing I am trying to do and trying to encourage others to do is to take more trains. 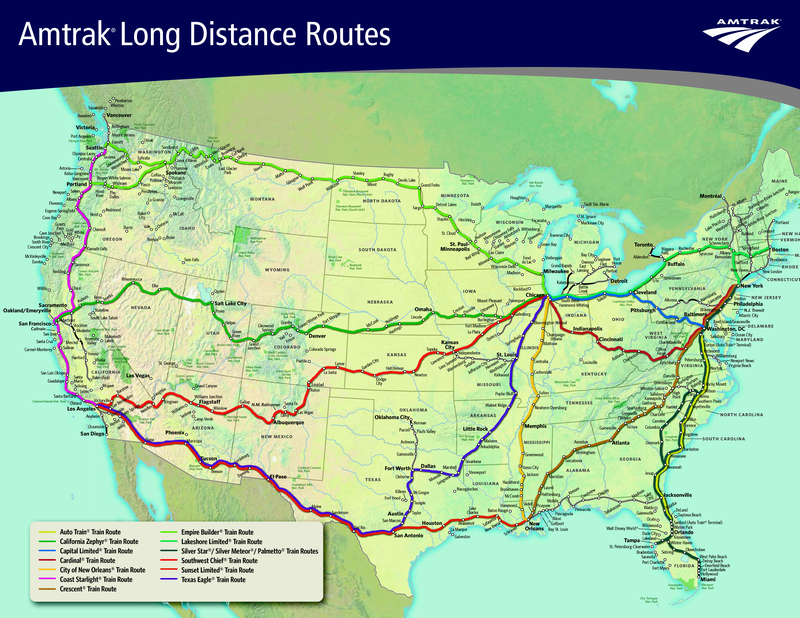 In the US, long-distance trains can be very useful depending on where one wants to travel. They are not always the fastest mode of transportation, but they are comfortable, convenient, have great views, and usually have wireless access if you need to work. And importantly, they save energy. 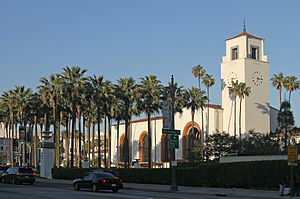 I work at the University of California, San Diego, and I’m taking the train up the Pacific coast to Seattle via Los Angeles, Santa Barbara, which we just passed, the Bay Area, Sacramento, and Portland. (It makes me think of Woody Guthrie’s “This Land Is Your Land.”) I’m traveling nearly 1500 miles (2400 km)—nearly the entire distance from the southern to northern border of the US. As I wrote in a blog post last summer, Amtrak trains expend about 1,600 BTUs of energy per passenger per mile, while planes use 2,500 and cars use 3,900. Trains are much more energy efficient than planes, cars, and buses, and by not flying to Seattle, I’m saving tons of carbon dioxide emissions. This is just a start, but I am trying to view flying as a luxury or necessary evil that I will avoid and reduce when possible. In any case, I’m excited to be part of the new and improved Sustainability Committee, and if you’re interested, join us at the AAS meeting! More importantly, make a resolution in 2015 to reduce your and your institution’s carbon footprint. The Public Policy Institute of California (PPIC), a nonprofit, nonpartisan thinktank based in San Francisco, recently conducted a survey of Californians’ views of environmental issues. This is particularly important in light of the ongoing drought in the southwest and the upcoming elections in November. According to the report (available in PDF format), the results are based on the responses of 1,705 adult residents throughout California, interviewed in English and Spanish by landline or cell phone, and they’re estimated to have a sampling error of 4% (at the 95% confidence level). I’ll describe what I see as their most interesting results, and if you want more information, I encourage you to read the report. Global warming: A strong majority say they are very concerned (40%) or somewhat concerned (34%) about global warming. Approximately two thirds of Californians (68%) support the state law, AB 32, which requires California to reduce its carbon emissions to 1990 levels by 2020, but the partisan divide (Democrats at 81% vs Republicans at 39%) has grown on this issue. 80% of Californians say that global warming is a very serious or somewhat serious threat to the economy and quality of life for California’s future. Only 45% of people are aware at all about the state’s cap-and-trade system, which took effect in 2012, but after being read a brief description, Californians are more likely to favor (51%) than oppose (40%) the program. Under a recent agreement between the governor and legislature, 25% of the revenues generated by the cap-and-trade program will be spent on high-speed rail, 35% on other mass transit projects and affordable housing near transit, and the rest for other purposes. Energy policies: overwhelming majorities of adults favor requiring automakers to significantly improve the fuel efficiency of cars sold in the U.S. (85%) and increasing federal funding to develop wind, solar, and hydrogen technology (78%). Strong majorities support the requirement that oil companies produce cleaner transportation fuels and the goal that a third of California’s electricity come from renewable energy sources. But residents’ support declines significantly if these two efforts lead to higher gas prices or electricity bills. (This is unfortunate, because gas and oil companies are heavily subsidized in the US, and maybe our gas and electricity bills are too low.) Most residents (64%) oppose building more nuclear power plants, as they have since the Fukushima disaster. The survey includes other contentious issues: 54% of Californians oppose hydraulic fracturing, or fracking, for oil and natural gas extraction. But a majority (53%) support building the Keystone XL pipeline. Water policies: Asked about some of the possible effects of global warming in California, majorities say they are very concerned about droughts (64%) or wildfires (61%) that are more severe. 35% say that water supply or drought is the most important environmental issue facing the state today (which is 27% higher than the fraction in a 2011 survey), and this is the first environmental survey in which air pollution was not the top issue. In another measure of concern about drought, strong majorities of residents (75%) say they favor their local water districts requiring residents to reduce water use. The CA legislature is discussing a $11.1 billion state bond for water projects that is currently on the November ballot, and a slim majority of likely voters would support it (51% yes, 26% no). If you’re interested, the PPIC has useful information and publications on water policies and management of resources: see this page and this blog post series. Water policy analysts argue that in the Central Valley, where most agricultural water use occurs, the failure to manage groundwater sustainably limits its availability as a drought reserve. In urban areas, the greatest potential for further water savings lies in reducing landscaping irrigation—a shift requiring behavioral changes, not just the adoption of new technology. Finally, state and federal regulators must make tough decisions about how and when to allocate water during a drought: they must balance short-term economic impacts on urban and agricultural water users against long-term harm—even risk of extinction—of fish and wildlife. This is a different topic and has nothing to do with the survey, but I want to use this opportunity to plug the People’s Climate March, which will be taking place on Sunday. (This website can direct you to events in your area.) One of the biggest marches and rallies will be in New York City, where the UN climate summit will soon be taking place. Even Ban Ki-moon will be participating! For San Diegans, you can find information about Sunday’s downtown events here. Californians also organized a “People’s Climate Train” to take activists and participants by train from the Bay Area through Denver and Chicago to New York, where they’ll be arriving tonight. Finally, I recommend reading this well written piece by Rebecca Solnit on Dr. Seuss’s The Lorax and the need to raise our voices on Sunday. Roger Pielke Jr., a professor of environmental studies at the University of Colorado Boulder, who is also currently a science writer for Nate Silver’s FiveThirtyEight website. (The controversy has been covered on Slate, Salon, and Huffington Post.) 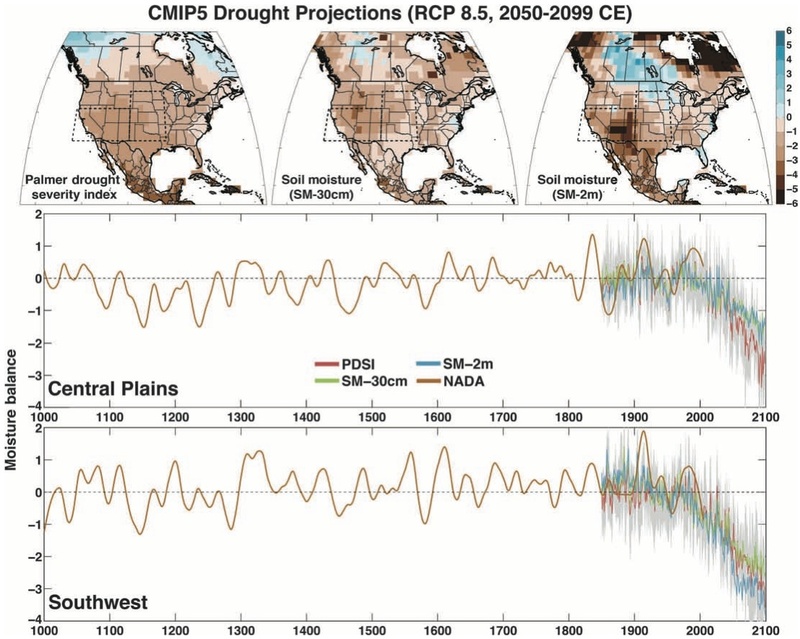 Silver’s work has been lauded for its data-driven analysis, but Pielke has been accused of misrepresenting data, selectively choosing data, and presenting misleading conclusions about climate change, for example about its effect on disaster occurrences and on the western drought. The short answer to the question, “How do scientists reach a consensus?” is “They don’t.” Once a scientific field has moved beyond a period of transition, the overwhelming majority of scientists adopt at least the central tenets of a paradigm. But even then, there likely will be a few holdouts. The holdouts rarely turn out to be right, but their presence is useful because a healthy and democratic debate about the facts and their interpretation clarifies which aspects of the dominant paradigm are in need of further investigation. The stakes are higher, however, when scientific debate involves contentious issues related to public policy. In those situations, once a scientific consensus appears to be reached and once scientists are sufficiently certain about a particular issue, we want to be able to respond effectively in the short or long term with local, national, or international policies or regulations or moratoria, depending on what is called for. In the meantime, the debates can continue and the policies can be updated and improved. Of course, it is not always straightforward to determine when a scientific consensus has been reached or when the scientific community is sufficiently certain about an issue. A relevant article here is that of Shwed & Bearman (2010), which was titled “The Temporal Structure of Scientific Consensus Formation.” They refer to “black boxing,” in which scientific consensus allows scientists to state something like “smoking causes cancer” without having to defend it, because it has become accepted by the consensus based on a body of research. Based on an analysis of citation networks, they show that areas considered by expert studies to have little rivalry have “flat” levels of modularity, while more controversial ones show much more modularity. “If consensus was obtained with fragile evidence, it will likely dissolve with growing interest, which is what happened at the onset of gravitational waves research.” But consensus about climate change was reached in the 1990s. Climate change skeptics (a label which may or may not apply to Pielke) and deniers can cultivate doubt in the short run, but they’ll likely find themselves ignored in the long run. Water policy issues are very important, but we haven’t discussed them much on this blog yet. Much of my information here comes from Ellen Hanak and other analysts of the Public Policy Institute of California (PPIC), analysts from the Union of Concerned Scientists (UCS), a recent article by Christopher Ketchum in Harper’s, a book by Robert Glennon (Unquenchable), and other sources. I’m not an expert on water policy, and any errors are my own. As usual, please let me know if you notice any errors, and I’m happy to hear any comments. I’ll focus on the southwestern US (mainly because I grew up in Colorado and now live in California), but many of these issues apply elsewhere as well. And while the Southwest is dealing with drought and water scarcity, other places, such as the UK and the Midwest US, are dealing with flooding. According to the Worldwatch Institute, already some 1.2 billion people live in areas of physical water scarcity, while another 1.6 billion face “economic water shortage”. 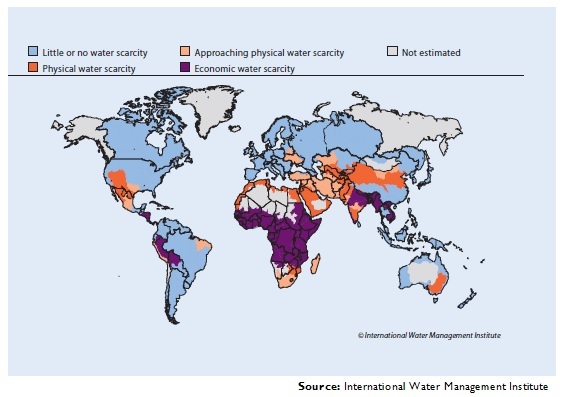 By 2025, almost half of the world will be living in conditions of water stress. Some analysts predict that water wars (see Vandana Shiva’s book) and conflicts will increase in the future. Considering that we need water to live, it’s not surprising that the United Nations General Assembly voted in a resolution declaring that access to clean water and sanitation is a fundamental human right. 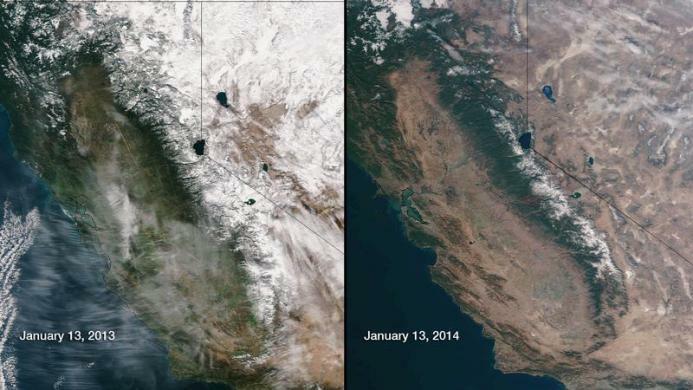 The Southwest and California in particular are experiencing their worst recorded drought (for example, see the NASA satellite images below). In response, the California state legislature and Gov. Brown passed a drought relief package last month, while Sen. Feinstein and others are seeking to pass a bill in Congress to aid drought-stricken states. Now here’s some historical and legal context. The Colorado River Compact of 1922 was negotiated by members of the upper-basin states (Colorado, New Mexico, Utah, Wyoming) and the lower-basin states (Arizona, California, Nevada), and it was an agreement for hydraulic management of the Southwest. According to the US system of water rights, however, the person who first made “beneficial use” of a stream or river had first right to it. Under this doctrine, the earliest users of the Colorado River (California) could legally establish a monopoly over regional water supply, even though most of that water came from another state (Colorado). 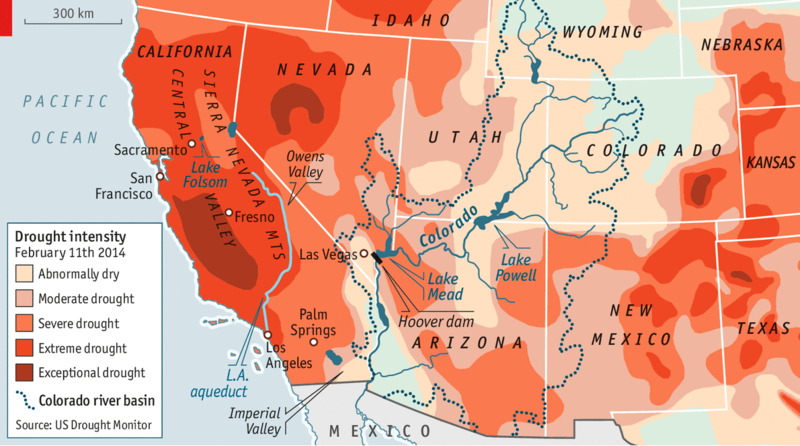 A major problem was that because 1922 happened to occur during an unusually wet period, people assumed that the Colorado held more water than it really did: its annual water flow as estimated to be 17-18 million acre feet, though it was later more accurately estimated at 14 million acre-feet (17 billion cubic-meters) on average. It was therefore already overallocated from the start. The lower basin (including southern CA) is now overusing its share of the Colorado River, and it’s not a sustainable situation. A court case (Arizona v. California) that was decided by the Supreme Court in 1963 affirmed that Arizona was owed 2.8 million acre feet of water annually, but under the doctrine of prior appropriation, Arizona’s rights would remain secondary to California’s. For water use, it’s useful to distinguish between water withdrawal (from surface or ground sources) and the consumption of water already withdrawn. Consequently, as argued by Ellen Hanak at a recent PPIC event in Sacramento, we need to consider not just water supplies but also water management and (in)efficient water consumption. Although one usually thinks of water for drinking, washing, cleaning, and other residential uses, much more water is used for irrigation (agriculture), industry, and power plants; according to the UCS, power plants account for 41% of freshwater withdrawals in the US. It’s also useful to distinguish between direct and indirect water use, and I’ll get into that more below. 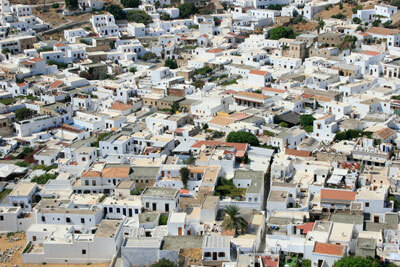 The largest fraction of water consumption is due to agriculture, power plants, and industry. Considering the fact that we indirectly need water because of our need for energy, this points to the issue of the “water-energy nexus.” The average U.S. family of four directly uses 400 gallons of freshwater per day, while indirectly using 600-1800 gallons through power plant water withdrawals. We need energy for water production and distribution (and the desalination plant being constructed near San Diego will require quite a bit), and we also need water for energy-related infrastructure. Coal and nuclear power plants use large amounts of freshwater to cool the plants: for example, a typical 600-MW coal-fired plant consumes more than 2 billion gallons of water per year from nearby lakes, rivers, aquifers, or oceans. In addition, as we discussed in my previous blog post, fracking techniques for extracting shale gas require millions of gallons of water to be injected into a well, and they can contaminate groundwater as well. Fortunately, wind turbines and solar photovoltaic modules require essentially no water at all, but other renewable energies, like hydroelectric, bioenergy, and geothermal, can be water intensive. As argued by Laura Wisland, since we expect climate change to increase the frequency and severity of droughts in California, it will be important to hedge our electricity supplies with predictable, renewable resources, especially wind and solar. What can be done? As a “silver lining” of the current situation, the ongoing drought in the Southwest provides a window for reform, and here are a few ideas. We should shift toward less water-intensive sources of energy such as wind and solar. Water should cost more: we should modernize water measurement and pricing with better estimates of water use and prices that reflect water’s economic value. We could learn from cities in dry places elsewhere (such as Australia) about how to make urban areas more water efficient, and we could have tiered water rates with higher prices for greater use. In agriculture, crops that cannot be grown without subsidies should not be grown. We need improvements to local groundwater management. Since surveys show that most Californians believe that there are environmental inequities between more and less affluent communities in the state, it’s also important to consider environmental justice issues while developing new water policy programs (see this article, for example). We need to develop more reliable funding (through state bonds or local ratepayers), especially for environmental management, flood protection, and statewide data collection and analysis. Finally, as argued in this PPIC report, water management agencies at all levels should aim to develop more coordinated, integrated approaches to management and regulatory oversight, drawing on scientific and technical analysis to support sound and balanced decisions. I attended a conference this weekend called “The Physics of Sustainable Energy” at the University of California, Berkeley. It was organized by people affiliated with the American Physical Society, Energy Resources Group, and a couple other organizations. Most of the speakers and attendees (including me) seemed to be Californians. I had some interesting conversations with people and attended some great talks by experts in their fields, and here I’ll just give you a few highlights. First though, I want to make two general comments. I did notice that only ~20% of the speakers were women, which is worse than astrophysics conferences, and it’s too bad the organizers weren’t able to make the conference more diverse. 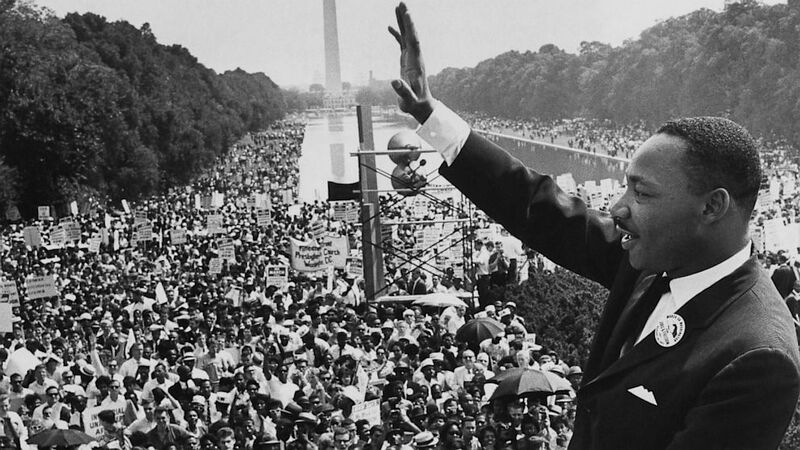 (There were a few people of color speaking though.) Secondly, I think it’s excellent that people (and not just in California) are actively involved working on solutions and innovations, but I think we should be careful about an technophilic or technocratic emphasis. This was a conference for physicists and engineers though, and energy policy and communication with the media and policy-makers, for example, were mostly beyond the scope of it. I was struck by the apparently close ties with industry some speakers had (such as Amory Lovins and Jonathan Koomey); to some extent that’s necessary, but I was a little concerned about potential conflicts of interest. …On to the conference. Ken Caldeira spoke about the global carbon balance. When accounting for CO2 emission per capita from fossil fuel use and cement production: the US is worst (50kg CO2/person/day), followed by Russia, China and the EU. California emits half as much as the rest of this country, but 2/3 of the difference is due to a fortunate climate (it doesn’t get very cold); according to an audience member (Art Rosenfeld? ), “we’re mostly blessed with good luck as well as some brains.” Daniel Kammen (one of the organizers) then talked about developing a framework for energy access for all. According to the International Panel on Climate Change (IPCC AR4 in 2007): “warming will most strongly and quickly impact the global poor.” Kammen described the concept of “energy poverty”: 1.4 billion people lack access to electricity today, and that will still be the case for a similar number in 2030, with more having unreliable/intermittent access. There appears to be a strong correlation between electricity access and human development index. 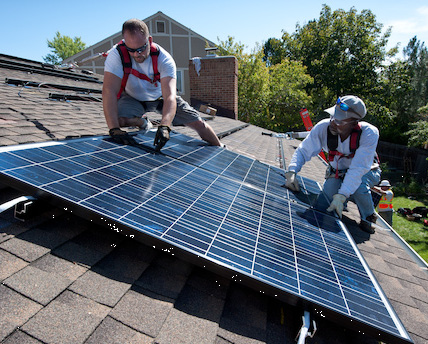 It seems that many people are working on interesting research & development on renewable energy sources. Jennifer Dionne spoke about the “upconversion” of solar cells, which includes thermodynamic, electronic, and photonic design considerations. The upconversion process improves cell efficiency by at least 1.5× (see Atre & Dionne 2011), and it often works well at optical near-infrared wavelengths. (She pointed out that of energy from the sun, 5% is in the UV, 43% in optical, and 52% in infrared. And if you’re interested in what those proportions are like for different types of galaxies, check out my recent paper.) Then Chris Somerville spoke about the status and prospects of biofuels, the production of which is currently dominated by the US and Brazil. The combustion of biomass has challenges for providing low-carbon energy: depends on tilling of soil, land conversion, fertilizer, transportation, and processing. I’m concerned about deforestation and effects on ecosystems as well as the effects on food/crop prices (remember the food riots in 2007-2008 and the rising cost of corn/maize?). In my opinion, Somerville didn’t sufficiently address this, though he did argue in favor of miscanthus and other biomass rather than the use of corn. 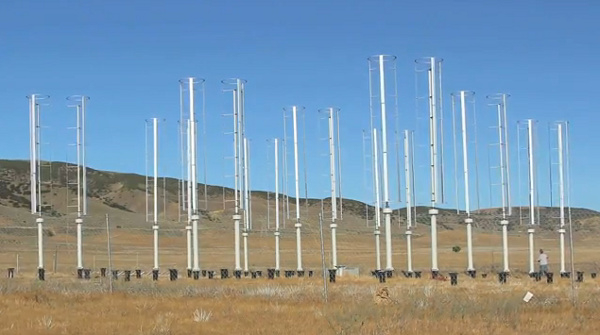 John Dabiri spoke about the advantages of vertical-axis wind turbines (called VAWTs, see the figure above), in addition to the ubiquitous horizontal-axis variety. VAWTs have a smaller structure size and cost, simpler installation logistics, and are safer for birds and bats as well. Currently only four countries get >10% of their electricity from wind (Spain, Portugal, Ireland, Denmark, followed by Germany with 9%), but this can be easily improved. 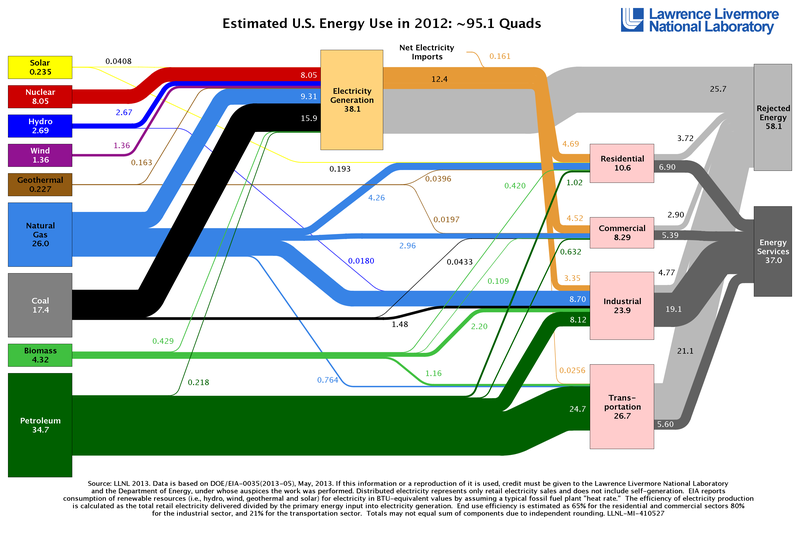 This flow diagram is pretty nice, and it describes current energy use in the US (presented by Valerie Thomas). 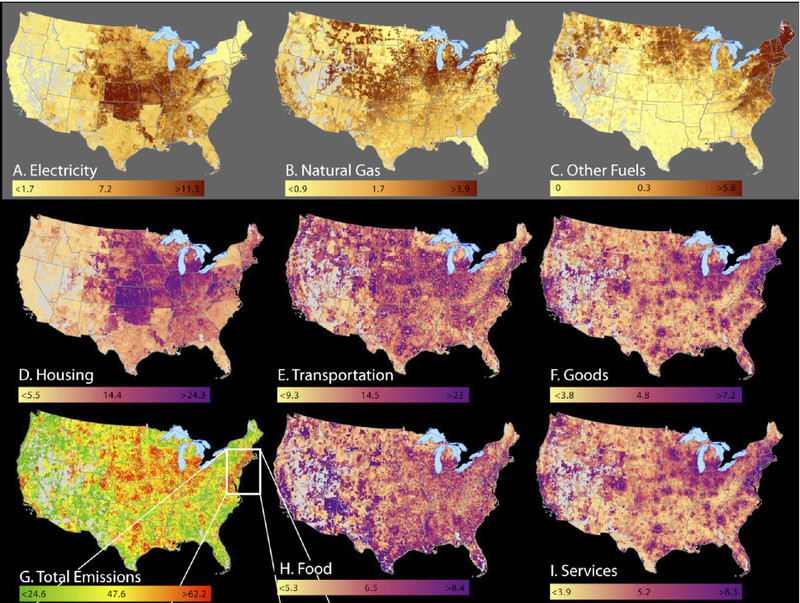 And Daniel Kammen, in a paper on the relation between energy use, population density, and suburbanization, shows the spatial distribution of carbon footprints (where the units are tCO2e, or total carbon dioxide equivalent per household). Tilman Santarius give a nice talk about energy efficiency rebound effects, which is closely related to my previous post, where you can find more information. He discussed the interactions between energy efficiency, labor productivity, human behavior, and economic growth, and he distinguished between rebounds due to an income effect vs a substitution effect. In any case, average direct rebound effects appear to be around 20-30% (Greening et al. 2000; Sorell 2007), in addition to a 5-10% of indirect rebound. In other words, around 1/3 of income savings due to energy efficiency is lost because of an increase in energy demand. He also talked about the psychology of rebounds, including moral licensing (such as Prius drivers who drive more) and moral leakage (people feel less responsible). 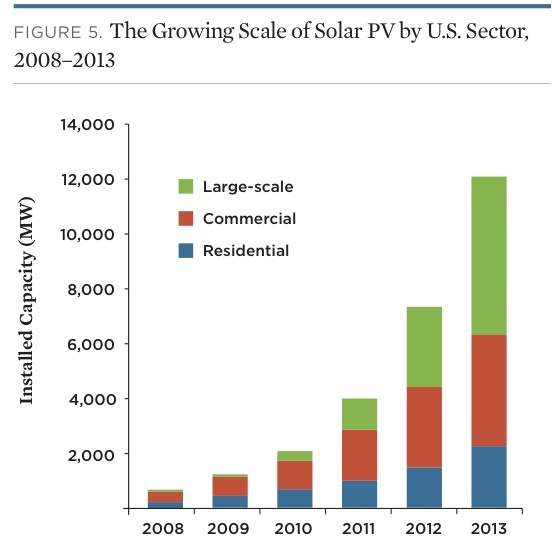 It will be a difficult task to try to separate energy demand from economic growth. There were many other interesting talks, but I’ll end with the issue of climate adaptation and geoengineering. Ann Kinzig described how the combined risk of a phenomenon is the sum Σ p (event) × impact (event). 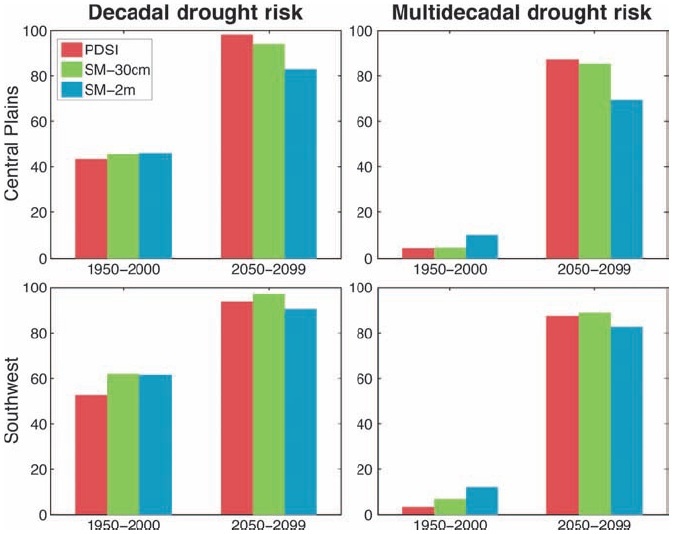 Mitigation seeks to reduce the probability p while adaptation seeks to reduce the impact. 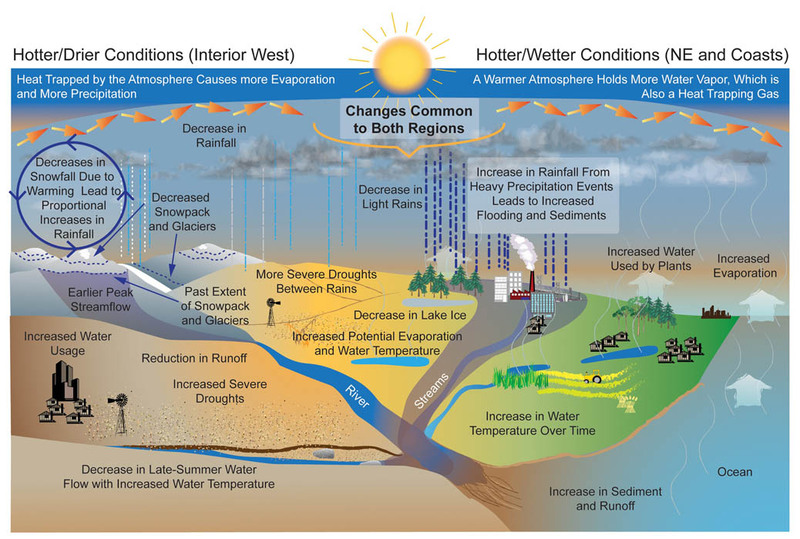 Climate change will have impacts on food, water, ecosystems, and weather events, and decision-makers in urban areas can try to prepare for these (see this website). Kinzig also spoke about historical case studies of failed adaptations by people in the Hohokam (Arizona), Mesa Verde (Colorado), and Mimbres (New Mexico) regions, and the dependence on societal hierarchy and conformity. Alan Robock spoke about the risks and benefits of “geoengineering”, which involves gigantic projects in the future to address climate change, such as space-based reflectors, stratospheric aerosols, and cloud brightening (seeding clouds), and basically involve using the Earth as a science experiment with a huge cost of failure. 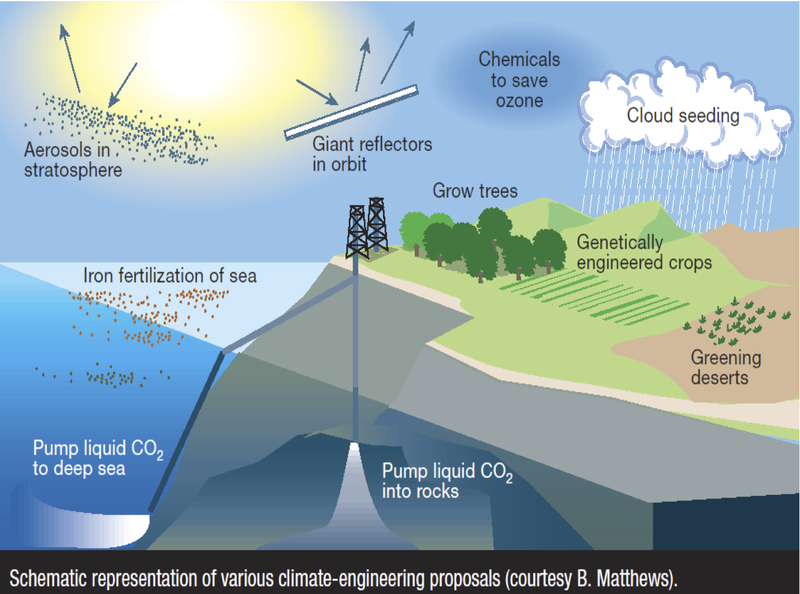 In particular, he studies the many problems of injecting sulfate aerosols into the stratosphere to cool the planet. (Some people have supported this idea because of the supposedly benign effects of volcanic eruptions in the past.) He discussed the potential benefits of stratospheric geoengineering but compiled a list of 17 risks, including drought in Africa and Asia, continued ocean acidification, ozone depletion, no more blue skies, military use of technology, ruining terrestial optical astronomy, moral issues, and unexpected consequences. For more on Robock’s research and for other useful references, go here.